Qonex was established in 2015 as the consulting arm of Nexor, expanding Nexor’s reach into new markets. 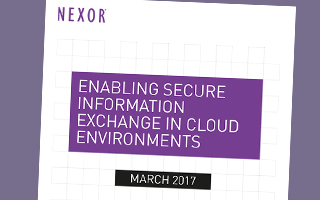 As Qonex built a position in the Cloud and Internet of Things (IoT) market segments, it became clear the architectural models and methodologies Nexor used in providing solutions in high assurance environments was equally applicable in the Cloud and IoT, albeit with different technology implementations. As such, Qonex has been absorbed into the core of Nexor to ensure the full breadth of our expertise is available to all customers across all markets. Our Cloud and IoT portfolio are designed to address the following common scenarios. The Cloud brings new opportunity to share business information for enhanced operational efficiency and stakeholder engagement, but it brings with it information disclosure risks. Additionally, sharing is often cross-domain, between different organisations, at differing levels of trust. The Cloud not only provides broad access to facilitate sharing, but provides enhanced security benefits that cannot be obtained from on premise solutions. Find out more about our solutions for cloud-based information sharing. Deploying the Internet of Things requires organisations to approach solutions differently to traditional IT services. Data from sensors typically resides in a different domain and trust environment to the services processing the data; in some cases, there is also a need to send control information back to the Internet of Things device. The approach requires concepts taken from secure information exchange solutions to ensure the trustworthiness of the data. Find out more about our solutions for Internet of Things security. The security assessment and security governance services, along with training and education, previously offered by Qonex, are not directly offered by Nexor. However, you can find more information on these topics and gain access to relevant companies through the East Midlands Cyber Security Forum. The East Midlands Cyber Security Forum is facilitated by Nexor, and supported by the East Midlands branch of the Institute of Information Security Professionals (IISP), the East Midlands Cluster of the UK Cyber Security Forum, and the East Midlands Chamber (Derbyshire, Nottinghamshire, Leicestershire). The Forum hosts 3 to 4 events a year, which are free to attend. More details on the East Midlands Cyber Security Forum website.